Huge Savings Item! 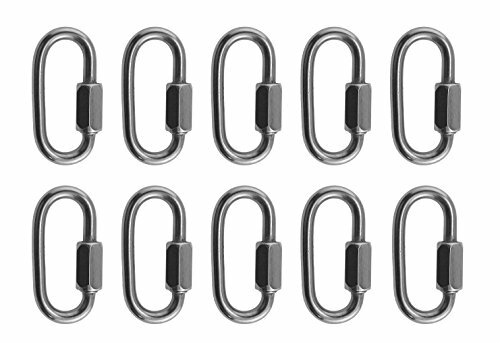 Save 14% on the 10 Pieces Stainless Steel 316 Quick Link 4mm (5/32'') Marine Grade by US Stainless at Kerinci. MPN: 43234-1281. Hurry! Limited time offer. Offer valid only while supplies last. This is for ten (10) quality marine grade stainless steel (AISI 316) quick links 4mm. The Imperial equivalent is generally considered to be 5/32''. This is for ten (10) quality marine grade stainless steel (AISI 316) quick links 4mm. The Imperial equivalent is generally considered to be 5/32". Each quick link is stamped 316. Not to be used for overhead lifting. AISI 316 stainless is a premium grade of stainless and is considered by many to be best in class. 316 stainless is corrosion resistant and very durable even in the harshest of conditions. Working Load Limit 616lbs.